The global health community is better prepared to face the largest outbreak of Ebola Virus Disease since the 2014-2016 West African epidemic claimed more than 11,000 lives, but funding from major donor countries is needed quickly to contain the current outbreak early. 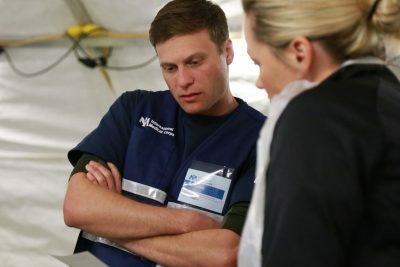 We talk with Dr. Adam Levine, the technical lead of International Medical Corps’ Ebola response, about the challenges facing those preparing to respond to the rapidly brewing emergency in Democratic Republic of Congo. 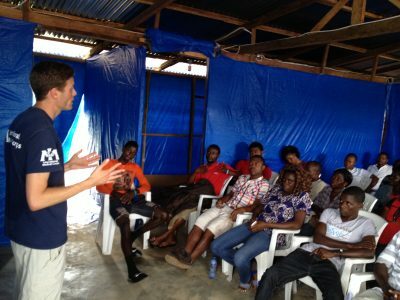 Q: What has the global health community learned about fighting Ebola in the four years since the West African outbreak? Dr. Levine: We went into that emergency with essentially no evidence base on how to diagnose or treat those who had contracted the Ebola virus. During the prior epidemics since Ebola was first identified in 1976, there had been almost no research on Ebola, and what we knew about the disease was largely anecdotal. During the 2014-16 epidemic we learned a tremendous amount, however. We learned about its epidemiology, and the typical signs and symptoms it causes in humans. We developed new tools for rapid diagnosis, vaccines to slow the spread of disease, and a promising new potential treatment, ZMapp, that may reduce mortality in patients with Ebola. All these are in our tool kit now. So today we have better knowledge and better tools to fight this disease than we had at the start of the last epidemic. But the structure of our response will be very similar to the one in 2014. We must focus on community education, public health messaging, health worker training, establishing screening to discover those suspected of having the disease and proper lab testing to confirm cases. We also need specially configured facilities –known as Ebola Treatment Units–to isolate and provide care for Ebola patients. All of this needs to happen for us to succeed. This also requires the commitment and the will from large donor nations whose funding is needed to make it all happen. Q: What about the speed of the current response. Are you heartened by the actions taken since the World Health Organization (WHO) first received notification of suspected Ebola cases in DRC two weeks ago on May 8th? Dr. Levine: Yes, I believe we learned important lessons from the last outbreak. In 2014, WHO waited 3-4 months before declaring a public health emergency. In that time the number of cases grew rapidly, making containment far more difficult. This time they have gone in quickly, identified it and mobilized resources to attack it. International humanitarian groups, including International Medical Corps, are moving quickly to set up a response. Community education, contact tracing, lab testing and treatment are all part of this process. Q: Who is financing this response? Dr. Levine: This is a major concern. There’s still very little funding from traditional donor governments or the private sector, so while the response is being planned, it hasn’t yet kicked into gear. We can’t afford to repeat the mistakes made at the onset of the last outbreak because if we wait too long to respond, the task of containing the outbreak will quickly become much greater and become much harder to accomplish. Donor governments—the United States, European countries and others—have to step forward. I’m very worried that governments might wait for the numbers of cases to increase, or wait for the outbreak to reach the capital, Kinshasa. That would be very wrong. If we act now, the response required to contain the outbreak can be relatively modest. If we delay until the outbreak grows, the cost to contain it could easily grow into the billions. The last outbreak cost $3 billion. Two-thirds of that money came from the US. Q: What about the vaccination campaign? Dr. Levine: WHO just launched the vaccination campaign yesterday. This is its first “real world” test. There was research conducted with the vaccine during the last outbreak, but this is the first real test. The strategy of the vaccination campaign will be the same though—identify all cases, trace all contacts, and contacts of those contacts and vaccinate them. The assumption is that we can identify all cases and vaccinate their contacts quickly. It remains to be seen whether that can be done in this new setting. Q: How difficult is it to carry out this vaccination campaign? Dr. Levine: There are lots of hurdles. The vaccine must be kept at extremely cold temperatures to maintain its effectiveness. This makes transportation and travel very challenging. We will also have to be able to rapidly identify new cases, trace their contacts, and convince them to accept the vaccine. If the vaccination campaign proves even moderately effective, though, it will be one more tool in our tool kit to fight this deadly disease. Dr. Levine: That we delay launching a robust response. Ebola has already reached the major city Mbandaka, a port city of 1.2 million. If it spreads from there to adjacent regions or to Kinshasa, we will face a far larger challenge to stop it.